A common tool people use for managing spam is SpamAssassin, and if you are using it, or just interested in learning more, you’ll want to check out my new Guide to Writing your own Add-On Rules for SpamAssassin. The Mad Hatter project at Sun should prove to be a real boon to Solaris users worldwide, particularly those who hate the transition from Windows or Macs to the more bare-bones CDE environment. Yes, I talk at length in Solaris 9 for Dummies about the transition from CDE to GNOME as a desktop environment for Solaris, but the Mad Hatter project definitely goes further than just a standard GNOME configuration. 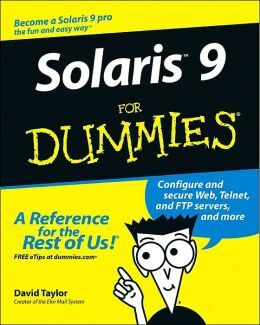 “Solaris 9 for Dummies” is out! I’m very pleased to say that my newest book, Solaris 9 for Dummies is out, and the copies I have look really great. Teach Yourself Unix System Administration in 24 Hours from Sams/Macmillan is my latest published book. Not only is this a sequel to my best-selling Teach Yourself Unix in 24 Hours but rather than focus on a single OS, the SysAdmin book simultaneously documents Red Hat Linux, Solaris 8, and the popular Mac OS X system. In just 24 sessions of one hour or less, readers of Teach Yourself Unix in 24 Hours will be up and running with UNIX, the operating system at the heart of the Internet.